Publisher: Taylor and Francis Group. IETE Journal of Research is a bi-monthly journal published by the Institution of Electronics and Telecommunication Engineers (IETE), India. It publishes scientific and technical papers describing original research work or novel product/process development. Occasionally special issues are brought out on new and emerging research areas. 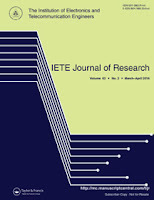 IETE Journal of Research is useful to researchers, engineers, scientists, teachers, managers and students who are interested in keeping a track of original research and development work being carried out in the broad area of electronics, telecommunications, computer science and engineering and information technology. IETE Journal of Research is a Bimonthly journal published by the Institution of Electronics and Telecommunication Engineers (IETE), India. It publishes scientific and technical papers describing original research work or novel product/process development. Occasionally special issues are brought out on new and emerging research areas. 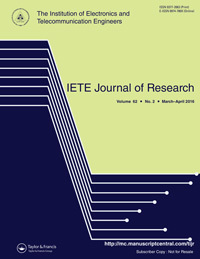 IETE Journal of Research is useful to researchers, engineers, scientists, teachers, managers and students who are interested in keeping a track of original research and development work being carried out in the broad area of electronics, telecommunications, computer science and engineering and information technology. Communications: Digital and analog communication, Digital signal processing, Image processing, Satellite communication, Secure communication, Speech and audio processing, Space communication, Vehicular communications, Wireless communication. Computers and Computing: Algorithms, Artificial intelligence, Computer graphics, Compiler programming and languages, Computer vision, Data mining, High performance computing, Information technology, Internet computing, Multimedia, Networks, Network Security, Operating systems, Quantum learning systems, Pattern Recognition, Sensor networks, Soft computing. Control Engineering: Control theory and practice- Conventional control, Non-linear control, Adaptive control, Robust Control, Reinforcement learning control, Soft computing tools in control application- Fuzzy logic systems, Neural Networks, Support vector machines, Intelligent control. Electromagnetics: Antennas and arrays, Bio-electromagnetics, Computational electromagnetics, Electromagnetic interference, Electromagnetic compatibility, Metamaterials, Millimeter wave and Terahertz circuits and systems, Microwave measurements, Microwave Photonics, Passive, active and tunable microwave circuits, Propagation studies, Radar and remote sensing, Radio wave propagation and scattering, RFID, RF MEMS, Solid-state microwave devices and tubes, UWB circuits and systems. Electronic Circuits, Devices and Components: Analog and Digital circuits, Display Technology, Embedded Systems VLSI Design, Microelectronics technology and device characterization, MEMS, Nano-electronics, Nanotechnology, Physics and technology of CMOS devices, Sensors, Semiconductor device modelling, Space electronics, Solid state devices and modelling. Instrumentation and Measurements: Automated instruments and measurement techniques, Industrial Electronics, Non destructive characterization and testing, Sensors. Opto-Electronics: Fibre optics, Holography and optical data storage, Optical sensors Quantum Electronics, Quantum optics. Power Electronics: AC-DC/DC-DC/DC-AC/AC-AC converters, Battery chargers, Custom power devices, Distributed power generation, Electric vehicles, Electrochemical processes, Electronic blast, Flexible AC transmission systems, Heating/welding, Hybrid vehicles, HVDC transmission, Power quality, Renewal energy generation, Switched mode power supply, Solid state control of motor drives. Contributions in areas not listed above but within the scope of the journal are also welcome. Journal of Pharmaceutics and Drug Research is an international multidisciplinary open access journal founded by Ke-He Ruan. This Journal is chiefly devoted to publishing high-quality papers focused on all aspects of pharmaceutics and drugs that are critical to the discovery and development of new drugs and therapies. www.scitcentral.com is a resource of indexed Engineering journals, our main mission is to help researchers, publishers and present indexed Engineering journals known by their best quality.